Known as the "big city of little neighborhoods," Milwaukee is chock-full of outdoor activities, great, shopping, world-class museums, and a unique roster of festivals and events that make a visit worthwhile any time of the year. The best part? You don't need to send a dime to have fun in Brew Town. Here's our list of 14 excellent free activities in Milwaukee. Milwaukee's impressive Basilica of St. Josephat was commissioned by Pope Pius XI in 1929, becoming just the third basilica in the United States at the time. The beautiful building is home to stained glass windows imported from Austria, and an interior painted by a Roman artist. The basilica is still very much an active church, but the visitor's center is open every day but Sunday. On Sunday, tours are offered at 10 a.m. following mass. Take in the amazing rotunda at the Milwaukee Central Library. Built from Bedford limestone, the main building combines French and Italian Renaissance architecture. Renovations and addition to the original building, completed in 1898, now take up the whole block. The building is listed on the National Register of Historic Places. After studying the impressive architecture, treat the little ones to free story time, or browse the on-site used bookstore. Visit your favorite animals at the Milwaukee County Zoo, free for all visitors on certain Family Free Days each year. Milwaukee County residents with I.D. also receive free admission on Thanksgiving Day, Christmas Day and New Year's Day. The zoo is home to 3,100 animals, across more than 400 different species. The Joan of Arc Chapel, a 15th-century French chapel located on the Marquette University campus, is a sacred place on campus for students, faculty, and staff alike. Remarkably, the chapel dates to the early 15th century, but it didn't always live at Marquette. The chapel was dismantled and shipped to Long Island, N.Y., before it was gifted to the university and opened its doors in 1966. Tours are free, and mass is held when university classes are in session. Traverse Milwaukee's Oak Leaf Trail by bike, skates or on foot. This extensive trail winds its way throughout the city and is a great way to experience some greenery without leaving town. The trail, which opened in 1939, connects the park system's emerald necklace and at first consisted of 64 miles. Today, it spans more than 100 miles, including 55 miles of off-road paths. Milwaukee might not be top of mind when it comes to spending time at the beach, but Lake Michigan's Bradford Beach is a favorite spot for swimming, sunbathing, and sand volleyball. The beach is also home to a full calendar of summer events, ranging from a hot dog eating contest to sand sculptors. Walk the length of the Milwaukee RiverWalk to enjoy the shops, restaurants, and bars lining downtown's waterway. If you want to try some of Milwaukee's famous beers, the three-mile-long RiverWalk is also home to several local breweries. There are also a few different art installations along the way, most notably a bronze sculpture of "The Fonz" from the television series "Happy Days." In addition to being beautiful, Milwaukee's City Hall building is incredibly impressive. At the time of its construction, in 1895, it was the tallest habitable building in the U.S. The building cost more than $1 million to build and was constructed from eight million bricks. Today, you can tour the building Monday through Friday. Each season, Milwaukee's historic Third Ward neighborhood downtown hosts Gallery Night and Day, a two-day art event where local galleries stay open late to showcase the works of their artists. While most of the galleries are concentrated downtown within walking distance, more than 30 galleries throughout the city typically participate, making this a fun way not only to discover galleries and explore museums but also to see the city. 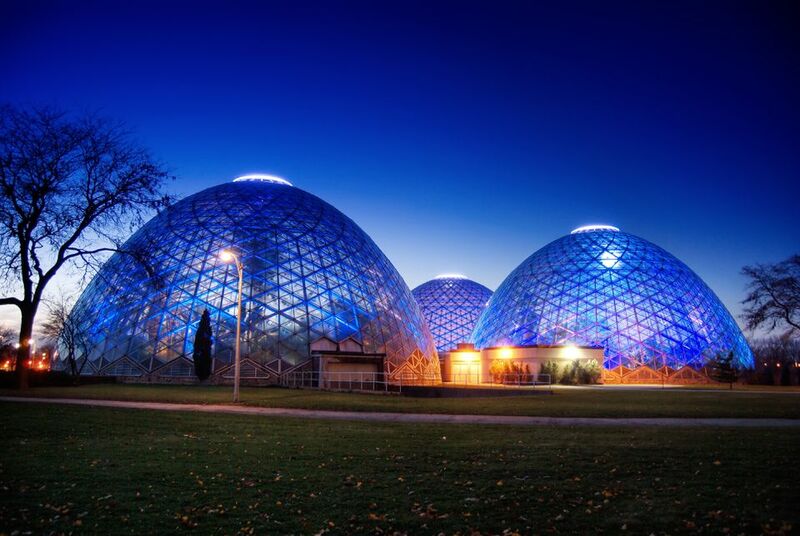 If you ever hear Milwaukee residents cryptically referring to "the Domes," they mean the Mitchell Park Horticultural Conservatory. The world's only conoidal glasshouses contain three different climates and samples of the flora associated with each; inside you'll find a desert, a tropical jungle, and a Floral Show, which showcases rotating displays. The Domes are open 365 days per year, but admission is free for Milwaukee residents on Mondays from 9 a.m. to 12 p.m.
For more than 25 years, Milwaukeeans have flocked to Cathedral Square Park in downtown to listen to jazz on summer evenings. The outdoor summer music series typically runs from the end of May through August and concerts take place on Thursday evenings. While lineups may vary, you can expect an eclectic roster ranging from jazz to funk to blues and more. The first Thursday of every month is free admission at the Milwaukee Public Museum, where visitors can explore the planetarium or the museum's extensive anthropology, geology, zoology, and history collections. There are more than four million objects in the museum's collection. Enjoy the wonders of the Milwaukee Art Museum, housed in a stunning Santiago Calatrava building that "flaps" its wings once a day. Building aside, the museum itself contains more than 25,000 works of art. It's particularly strong in American decorative arts, German Expressionist prints and paintings, folk and Haitian art, and American art after 1960. Admission is free for all on the first Thursday of each month, while kids 12 and under, members, and Wisconsin K-12 teachers with valid school ID or a pay stub are always free. Each September, the Milwaukee River Challenge splashes into town. This regatta races along the Menomonee and Milwaukee Rivers, bringing more than 900 participants. Spectactors watch from along the Riverwalk, adjacent bridges, or at the finish at Schlitz Park.